Is It Safe To Take Wellbutrin While Breastfeeding? Maya was slipping into depression. She had a baby a few weeks ago, and like many other mothers, she was finding it difficult to cope with the additional responsibilities and anxieties. When her condition was going out of hand, she visited a doctor. The professional prescribed anti-depression drug Wellbutrin. But Maya was not very sure if she should use it. She was breastfeeding her baby, and she read that a small amount of the drug can seep into her breast milk and then into the infant. So, can you take wellbutrin while breastfeeding? MomJunction answers that question and tells you about the side effects the drug could have, and the safety measures you need to take. Wellbutrin, the drug name being bupropion, is a medication indicated for the treatment of seasonal affective disorder and depression. Bupropion is also available under the trade names Zyban, Forfivo XL, Buproban, Budeprion and Aplenzin. The medication is available as Wellbutrin, Wellbutrin XL and Wellbutrin SR, and the generic bupropion. They vary in the way the chemical enters the body. For instance, Wellbutrin, Zyban and generic bupropion are classified under “immediate release” bupropion, Wellbutrin SR as “intermediate release” and Wellbutrin XL as “extended release”. What do these various ‘release’ mean? Immediate release means that the formulation of the drug is released into the bloodstream immediately, for a short span. The SR formulation mixes in the blood gradually in 12 hours while XL takes 24 hours. 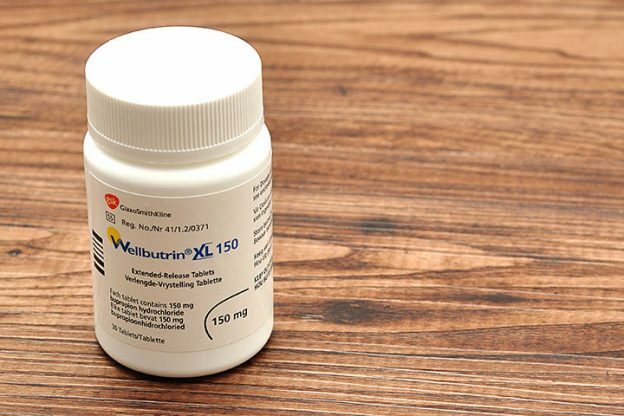 Wellbutrin belongs to the antidepressant class of drugs called norepinephrine-dopamine reuptake inhibitors (NDRI). These help in balancing the levels of dopamine and norepinephrine, the neurotransmitters in the brain that enhance your mood (1). Keep reading to learn if a breastfeeding mother can have it as an anti-depressant. Yes. In most cases, bupropion is not harmful to the baby, as the drug enters the breast milk in small amounts. A nursing mother need not stop breastfeeding her baby while taking the drug. However, make sure to check for any reactions in your baby. Observe him keenly. Check for the symptoms such as vomiting, sedation, diarrhea, and jitteriness. Measuring serum levels may rule out toxicity concerns. 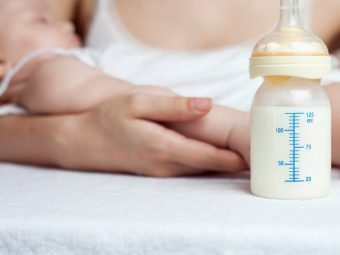 Research reveals that an average of 0.2% of the maternal weight-adjusted dosage of bupropion and 2% of the maternal weight-adjusted dosage of bupropion plus metabolites is received by an infant on exclusive breastfeeding (2). In an uncontrolled online survey conducted on 930 nursing mothers on the antidepressant, nearly 10% infants displayed infant drug discontinuation symptoms such as uncontrollable crying, low body temperature, irritability, eating and sleeping disorders. The discontinuation symptoms were less noticed in babies whose mothers used antidepressants only while nursing, compared to those who had them even during pregnancy (3). One report showed that a baby exposed to bupropion had seizures (4). As the mother stopped the drug, the seizures too stopped. While research shows the impact on the baby, the mother too has the risk of facing side effects. You may experience some common side effects such as a change in appetite, dry mouth, weight loss, loss of libido, nausea, dizziness, weight gain, and muscle pain. Severe side effects may include hallucinations, increased heartbeat, confusion, seizures, and skin reaction. Seek immediate medical advice if you have any side effects after taking medicine. Is there a way you can reduce the effect of the drug on yourself and your baby? Follow these simple measures to mitigate side effects for you and your baby. Inform the doctor about any other health issues such as hypertension, bipolar disorder, heart disease, seizures, spinal cord or brain tumors or liver disease, before starting Wellbutrin. Also, tell him if you have taken a Monoamine oxidase inhibitors (MAOI) within the last two weeks, as Wellbutrin is not compatible with MAOIs. A sudden withdrawal of bupropion may lead to symptoms like dizziness, anxiety, nervousness, and stomach upset. Thus, experts suggest gradual withdrawal of the drug after discussing it with the doctor. The drug can reduce the quantity of milk in some nursing mothers. If you notice such a thing, talk to your doctor immediately. He may recommend alternative drugs such as nortriptyline, paroxetine, sertraline. Note: Any drug should be continued or discontinued only with the doctor’s approval. Wellbutrin may not be harmful to your baby, but the risk of seizures always exists. Take any drug only on prescription. If you observe any side effects, talk to your doctor. Most importantly, try to reduce your anxieties and depression through natural means such as Yoga and meditation. Keep the usage of drugs as your last option. Did you take Wellbutrin while nursing your baby? Was it safe or did you face any side effects? Share your experience with other nursing mothers, in the comment section.